Listed below are eight areas where churches can implement all or part of member mission. The list is not complete but does give an idea of the wide range of possibilities. Give special thought to beginning with three or four of these activities: numbers 2, 8, 9, 10, 14, 21, 36, 37, 38, 39, 40, 44, 48, 49, and 50. For a shorter list, see Basic Tools 13 (Moving member mission further into the congregational life). 1. Form a worship committee to work with the clergy to implement some of the following options. 2. Plan worship so that the prayers include all seven mission fields in some way. 3. Recognize and pray regularly for groups of members (and nonmembers where appropriate) in the seven mission fields – e.g., those working in health care (work), community groups (local community), parents (home), national organizations (wider world), etc. 4. Invite a different church member each week – or month – to comment on how the Gospel connects with her/his daily life and incorporate this sharing into the sermon in some appropriate way. 5. Encourage members to be thinking about their daily missions as they come to church on Sunday, listen for a word the Spirit may have for them, and receive the Lord’s guidance and help in the teaching and in the sacraments. 6. Plan the Easter Vigil – if you practice it – for maximum participation and include readings from the prophets that call for justice in public life. 7. In the members’ own prayers, encourage devoting daily prayer time to a different mission field each day of the week until each field becomes a natural reference in their reflection on scripture and prayer; or build an intercession list around partners in each of one’s mission fields. 8. The official board chooses as the congregation’s primary purpose – or chooses to include among its primary purposes – calling, forming, sending, and supporting the members as missionaries in all of their daily living; plans how to keep this purpose before the members and to note their comments on it; and plans how to review it for needed revision regularly. 9. The official board calls and leads a congregational meeting to introduce member mission. 10. A pilot group is started followed by groups open to all to discern their daily missions using some form of the worksheets from Basic Tools numbers 1, 2, 3, 3 – A, 3 – B, 3 – C, and 3 – D.
11. Provide an ongoing way for all members who desire to do so to discern their daily missions – again – using some form of the worksheets from Basic Tools numbers 1, 2, 3, 3 – A, 3 – B, 3 – C, and 3 – D.
12. Carry on the Christian education of children by seeing them as already on mission in each of their own daily mission fields. 13. Teach a Christian way in making decisions that sums up the Christian ethic and teach openness to constant learning about ways to love and to be just (see Chapter 11, “Decision Making for the Missionaries,” of When The Members Are The Missionaries ). 14. Train leaders to guide groups: in identifying what they are now doing to make life better in each of their daily places; in using the worksheets to discern a mission in each mission field; in distinguishing between member missions and congregational missions; and in forming ongoing support groups. 15. Ground Advent and Lenten programs in the daily mission fields. 16. Every six months, focus on a different daily mission field by asking each member to list his/her current mission there and how much time each expects to give it each week. Follow through with special teaching, speakers, and events about that mission field. 17. In the spring, as part of stewardship, ask members how the church can help them in each of their daily mission fields and plan the next year’s program around their responses. 18. Keep a supply of Basic Tools number 3 – C, “Your Daily Missions at a Glance,” and Basic Tools number 3 – D, “Developing Your Personal Road Map” available for people needing fresh copies. 19. Teach a spirituality that empowers the members for mission – a contemporary form of Christus victor atonement (see Ch. 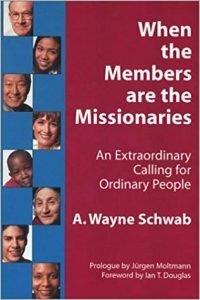 12 of When The Members Are The Missionaries). Evil, sin, and death prevent us from being at one with God. God’s victory over evil, sin, and death was made known in Jesus Christ and Jesus shares his power – the Holy Spirit – with us to help us to cope with them. We are now at one with God as we share in God’s mission. 20. Teach that, when, in baptism, we join Jesus in the contest with evil, sin, and death. We cannot overcome evil on our own, we need his help and power. Stress that Jesus overcame evil during his ministry and in his rising from death when it looked like evil had triumphed. He is Christus victor – Christ, the victor over evil, sin, and death. Teach that he alone can help us to carry out the missions we undertake in his name by sharing his power, the Holy Spirit, with us (John 20:22). 21. Teach that we are God’s co-workers whose relationship with God is one of collaboration with God rather than submission to God. While we are God’s “children,” we are adults who can make the mature, adult decision to commit ourselves and all of our decisions about how to live to the Lord for guidance and power to carry them out. 22. Teach that the Eucharist or the Lord’s Supper is where we can find the guidance and the power to carry on our daily missions. 23. Teach that discerning our daily missions in each of our daily mission fields is essential spiritual formation for those who have not done so already. 24. Beware, especially, of a literal substitutionary atonement which so dominates the media. Also termed satisfaction atonement, this view sees: Jesus’ death as the payment God requires for a debt we have incurred by our sin; God’s honor and justice can be restored only by someone being punished by death to pay for our sin; and this is what Jesus undergoes for us in his crucifixion. We, also, need to be intentional about questioning the oversimplified “Jesus died for your sins – just accept what he has done for you.” We don’t need Christians who only feel forgiven; we need Christians who will act. A television preacher one Sunday said, “I am telling you the Gospel. You listen and you can be set free,” without going on to say how we are to exercise that freedom. Be sure to talk about what is expected of us and that in our baptism we have joined Jesus in his struggle with evil, sin, and death. 25. Encourage trust in the Holy Spirit to give us the gifts we need to carry out whatever missions we are called to take up. 26. As much as possible, the pastor and leaders should be aware of and talk with the members about their daily missions. 28. Coach lay visitors on how to celebrate the daily missions of fringe and lapsed members. 29. Find and carry on, at least, one community service that demonstrates that the church is a loving friend of its community. 30. Where possible, select a community service that helps low income people. 31. Choose a community service that brings church members face-to-face with the people helped. Go beyond the obvious of providing meeting space for non-church groups. 32. Be sure that all the people helped by the church’s community services are invited to and welcomed at worship and church activities. 33. Increase the ability of members: to talk with non-church people about where they see God at work in each of their daily mission fields; and to invite them a church activity appropriate for them. 34. Increase the ability of members to ask non-church people to work with them to achieve common goals. 35. Let living as agents of the mission of Jesus Christ be reflected in all handouts for newcomers. 36. Make sure all communications – print, web page, handouts, etc. – carry the message that to be part of this church is to be on mission in every part of daily life. 37. Center the orientation of newcomers on God’s mission and help each newcomer to discover the daily missions they may be living right now. Draw on Basic Tools numbers 1, 2, 3, 3 – A, 3 – B, 3 – C, and 3 – D as needed. 38. Teach that baptism is joining God’s mission in Jesus Christ and being guided and empowered for it at Jesus’ table among Jesus’ people. 39. Teach that confirmation (and reception and reaffirmation) is re-commitment to joining God’s mission in Jesus Christ and help the candidates to discern their current daily missions. 40. Build preparation for baptism and confirmation around the discerning of the participants’ current daily missions in each of their mission fields. Draw on Basic Tools numbers 1, 2, 3, 3 – A, 3 – B, 3 – C, and 3 – D as needed. 41. For baptizing infants and young children, follow the same pattern with their parents and godparents (see Appendix C, “Discerning Present Concerns and Goals as Missions,” in When The Members Are The Missionaries). 42. Teach communion as the time of being fed by Jesus Christ with the power to carry out our daily missions. 43. Plan how to hold up baptism as joining Jesus’ mission and to place the font (if it is movable) so that it has maximum visual impact (for example, in the center aisle as people enter and leave the nave). 44. Gather people who have worked through discovering their current daily missions to form groups for mutual support. For example, you could have groups of two to six meet biweekly for 75 – 90 minutes. The groups may want to meet for a limited time period and then assess re-commitment or forming a new group. Be sure to provide for monitoring these groups. 45. Possibly, base these small groups on Bible reflection (e.g., the “oral method” on pp. 165-167 of When The Members Are The Missionaries) and the sharing of daily missions. Groups could also be formed around a specific mission field, such as a group for new mothers focused on the mission field of home. Book studies are also an excellent method to draw people together with common interests. 46. Try to conclude any small group meeting with prayer requests and promises of daily prayer support and begin the next meeting with sharing of what happened in the area of each request (see p. 167 of When The Members Are The Missionaries). 47. At all events, especially those out in the community, provide materials – handouts, charts, posters, worship times – that invite all non-church participants to return at any time for any event or activity. 48. Find ways to include discerning and sharing our daily missions in each congregational group. One way to do this might be doing slides KL-2 to KL-6, Worksheet One, and KL-7 (from Member Mission’s Workbook available in draft form by writing membermission@aol.com) with each group. This provides a basis for group members to begin to think about their daily missions and how their group can connect with and support their daily missions. 49. Work with each church group to restate its purpose so its purpose connects more directly with the daily missions of its members. Plan how the daily missions of the members might shape the activities of their group in an ongoing way. 50. Teach that pledging is each home’s share in supporting the daily missions of every member. Church life is like a mountain climber’s base camp. It’s a place that provides the support and guidance to carry out one’s daily missions. Pledging supports this base camp. 52. Year round stewardship teaching connects the talents and gifts of the members with their daily missions. 53. In the Spring, survey church members for how the church might help them in each of their daily mission fields and, then, build the church’s activities for the Fall around their answers. And, make sure the next year’s budget planning reflects their answers as well. 54. See that all the church’s buildings are warm and welcoming.